My day begins by springing out of bed with the sun, bright and early at 6AM. After saying good morning to my dog, I'm out the door, into the fresh, clean outdoor air. The first task at hand is to fill my watering can, and give a small drink to the corn growing in my field. From there, I stop by the barn and talk soothingly to my horse as I give him a nice brushing. From there, I head out into town, stop by the store and buy a nice gift, and visit Mary as she goes to open the library at 10. A nice chat with her, and I give her my gift (wow is she pretty, I hope she notices I keep hanging out there pretending to be interested in the books). That leaves me the rest of the day to buy anything I might need, chop some wood for the new house extension I've been wanting, and to earn a bit of extra money while waiting for my corn to be ready to harvest. Around 9PM I'm feeling worn down, and head back home to go to bed. A good night's sleep, and I'll be bright-eyed in the morning, ready for a new day. 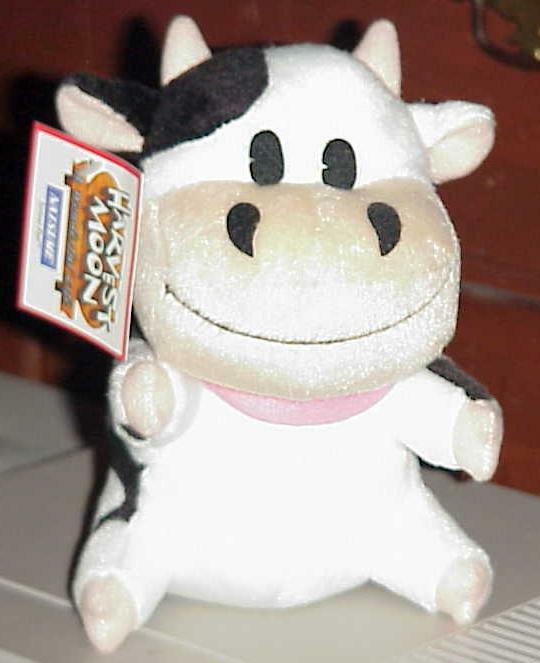 This is the life of Harvest Moon. If you've played Harvest Moon games in the past, you have a pretty good idea of what to expect here, and much of this paragraph will seem familiar, although it still might be worthwhile to read just so you know that everything is in this version. If you haven't played a Harvest Moon game before, you're in for a dramatic change of pace. In Harvest Moon, you are tasked with taking over a farm that was left to you by a kind old man you met when you were a child. The ostensible ''goal'' of the game is to earn money, and this can be done a number of ways. You can choose to focus on growing crops, raising sheep, hen eggs, or any number of combinations and possibilities. The money you earn from this will allow you to purchase things such as better tools, a bigger house, or gifts for a lucky lady. 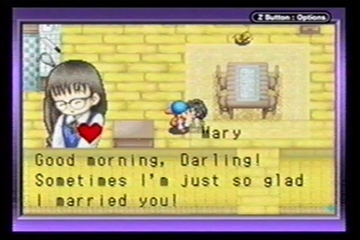 Which is the other ''goal'' of Harvest Moon, to get married. In the town, there are a number of young women around your age, ranging from the shy librarian to the outgoing girl at the winery. Who you choose to focus your interests on is up to you. While getting married isn't by any means ''required'' to progress in the game if you really don't want to, it is there as another main focus if you do. As you talk to your ladyfriend and give her gifts, she'll slowly become more affectionate toward you (represented by a heart icon that will change color as their mood changes. If only real life could be that easy), and when the time is right, you pop the question and hope they say yes. Once you're married, if you're a good husband, there may be a child in your future if you're lucky. Even once that's done with, that certainly isn't the end by any means, there's still a farm to run, money to earn, things to buy, and a life to live. The game is far from over. So, that's basically what there is to Harvest Moon. If you've played others before, most of this probably sounds familiar. If you haven't, you may be asking yourself at this point ''So I get to raise a farm? That's it?'' If you are asking yourself that at this point, well then, yes, that is basically it. So, while there are still some more details and points to cover, if the basic core of the game doesn't sound appealing to you, then there isn't much that can be said from here out which will convince you that you'll enjoy the game. If it doesn't sound interesting to you at this point, chances are you're not going to like the game. So now, if you're still reading at this point, either you've played Harvest Moon games in the past and were already fine with the core ideas, or the beginning part has sounded interesting and you want to find out more. From here, there's a couple different points of view you could be taking, and it may best serve everyone to break it into sections as to where you are coming from. This is easily the best Harvest Moon game available for the Gameboy, much better than any of the previous ones. It includes essentially anything that any of the console Harvest Moon games have had (unlike previous Gameboy ones, which have cut out significant parts such as the town or relationships), as well as even a few new or expanded things. You won't feel as if you're playing a watered-down version just to get something you can take with you, everything that you could want is there. If you're just hoping to get a new Harvest Moon which gives you new features that improve over ones you already have, this probably isn't going to fill that. While it's certainly an excellent game, it isn't that much different from console ones you might already own where, if you're only playing this game when you could be playing the console one instead, as opposed to on the go so it's your only choice, you probably won't feel as if it's different enough to make it worthwhile. If this is going to be your only version of Harvest Moon, if you feel you're going to make use of its portability enough for that to set it aside, buying this one would probably be a good choice. If you wouldn't make enough use of the portability, it's still fairly close to a toss-up, but you'd probably be slightly better off going with the SNES or N64 versions if those are choices as well. End result: You could go either way and end up happy, so, whichever is easiest and works best for you. 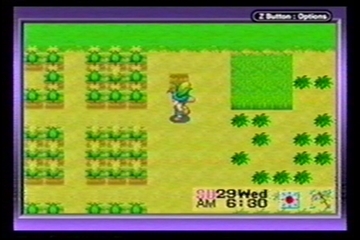 Essentially, the core of Harvest Moon is what it is, a farming game. There are a few side things, such as annual horse races or other events to mix things up. The relationship aspect is very good, and gives another main thing to do in the game. If the farming aspect of the game doesn't appeal to you however, the game itself won't. If the farming aspect has appealed to you in the past however, or it sounds interesting enough for you to give it a try, it's definitely worthwhile. The graphics and sound aren't anything to get excited about, they're basically the same as they are in any other version. If fancy graphics and such is important to you, that's probably going to leave you feeling disappointed. That said, as with the other versions, they do a good enough job for what they're trying to do, it shows what you need to see, and everything looks and sounds fine, they won't detract any from your game experience. For the beginning part of the game, you have the two main things going on, trying to raise your farm and also trying to get a wife and child. That will take at least a couple of years game time however, so, it's not exactly something that will be done with on your first day or anything. Once that's done though, you're just left with the farming. While the same thing day after day might wear thin for some, if you liked it at the beginning, it's still the same thing years later, so, it can hold onto your interest for quite some time. Unless you're only interested in this game as competition with your time with a console version of Harvest Moon, if the basic ideas of the game sound interesting to you or you want a version to play on the go, this is definitely a game to get.